This micromanoscope is a static differential pressure manometer, which facilitates for quick and accurate measurements of differential pressure. 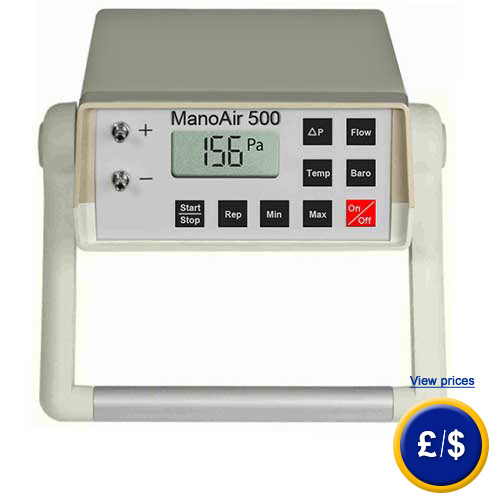 The universally applicable micromanoscope ManoAir500 displays apart from Pa, mbar and mmH2O also immediately the flow speed of gasiform media. Therefore temperature of that medium, effective surrounding pressure and humidity are also factored. This hard-wearing device can for example also be used with a dynamic pressure sensor , in order to determine the flow speed in channels. The micromanometer stands out due to its universal operation range as a relative and differential pressure meter with the potential of flow speed measurement under natural conditions (compensation of medium temperature, humidity and surrounding pressure), as well as volume flow rate determination through variable channel calibers. Thus the micromanometer is ideal for application in industry, service and in laboratories. If there are any questions about this micromanoscope ManoAir500, please have a look at the technical specification below or call: UK customers +44(0) 23 809 870 30 / US customers +1-410-387-7703. Our technicians and engineers will gladly advise you in all manometers and all products in the field of measuring instruments, regulation and control and scales. - ISO calibration certificate After some time of operation in a factory alternations at the micromanoscope ManoAir500 might occur und thus the measurement accuracy of the device might be compromised. A Recalibration in laboratories as well as a certification according to ISO you can commission from us at any time. Surely also for your initial order.